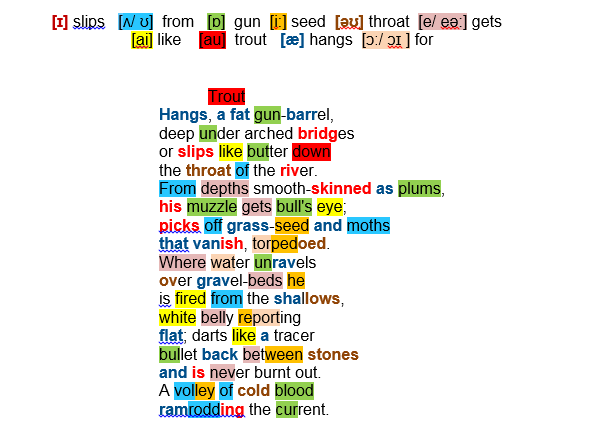 The first quatrain is formed around contrasting verbs: one of motionlessness, the other of movement: at one moment the fish Hangs (as if suspended in the water), its latent power like a fat gun-barrel waiting to be triggered; next it stirs (slips), sliding effortlessly like butter down the throat of the river. The trout’s design enables it to operate from the river’s depths smooth-skinned as plums from where it adopts the ‘target-and-fire’ approach of a hunter-submarine: its search for food (grass-seed and moths) is loaded with sniper imagery (muzzle … bull’s eye … picks off … torpedoed). Nearer to the surface where the river’s flow is more fragmented (water unravels/ over gravel-beds) the fish lets fly from the shallows, its body tracing a missile track across the surface: white belly reporting/ flat. Equally speedily, the trout takes shelter (darts like a tracer-/ bullet back between the stones). With its pitiless (cold blood), cannon-like explosive power the fish is more than a match for the river: a volley … ramrodding the current.